Hello, my name is Melissa Baker and I am your GEAR UP academic specialist for Jenkins Middle/High School. GEAR UP stands for Gaining Early Awareness Readiness Undergraduate Program. I am currently focusing on grades 4-11 n my program as my cohort. I have hired 2 tutors with GEAR UP funds, in hopes of improving test scores on the MAP and KPREP testing. Anita Bolt is a tutor at JMHS and is working with our 6-8th grader in Language Arts. I also have Scott Guthrie that is working with our Middle school math classes and he was a former middle school math teacher here at Jenkins middle/high. These 2 tutors, along with myself, work hard in preparing our students to reach proficiency. We have used GEAR UP funds to purchase materials for use in the classroom. Some of these materials include: Chrome books, individual wipe-off boards, the latest in calculator technology with the TI nspire, and Common Core readiness practice material for middle school mathematics and language arts. 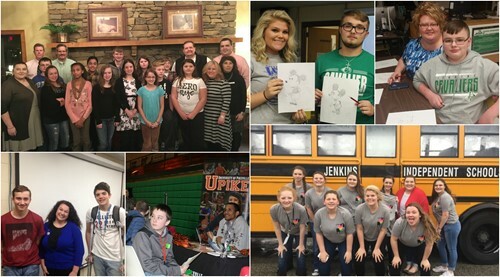 Some events that GEAR UP has organized in the past include such things as: East Ky Science Center field trip, Toyota plant tour , and "Hooked on Science Guy", Jason Lindsey. Some of our recent college visits include UVA Wise, University of Kentucky and EKU college visit for our 8,9 and 10th graders, a visit to the Challenger Center at HCTC in Hazard. I am excited to continue working with the students at JMHS. I am looking forward to helping the students plan their future. Feel free to contact me at school with any questions regarding GEAR UP at 832-2184. Hello, my name is Caitlin Collier and I am your GEAR UP College and Career Guide for Jenkins Middle High School! I am at the school to provide guidance, opportunities, and support to high school students to help them achieve and surpass their future college and career goals. So far in my career at Jenkins Middle/High School, I have worked with Melissa Baker to create a GEAR UP club and Student Attendance Committee for Jenkins High School. The Jenkins GEAR UP club is dedicated to developing leadership through service in the Jenkins Community. The Student Attendance Committee is a student-led organization working towards increasing the attendance of high schools students at Jenkins High School. Community service projects for Letcher Manor nursing home, domestic violence shelters, Hurrican Harvey Victims, and many more.